A Salford University prosthetics expert enabled a man to follow his dream of living as a goat. 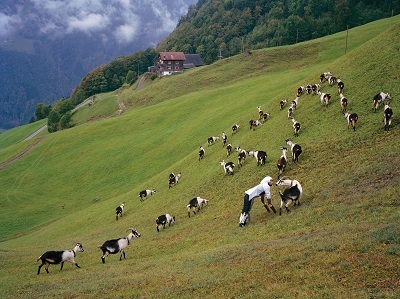 Conceptual designer Thomas Thwaites spent several days studying their behaviour up close by living as part of a herd on the Swiss Alps. Thomas’s research saw him transform himself into one the animals and even attempt to communicate with them. And to make his experience all the more realistic, he enlisted the help of Dr Glyn Heath from the University’s School of Health Sciences, who he asked to help make him a set of special goat-like artificial limbs enabling him to roam around on all fours and closely mimic the animals’ movements. Dr Heath, a former zoologist, has previously created prosthetic limbs for cats, dogs and birds of prey – and had once been invited to design a prosthetic for a giant panda – but he admitted, the goat request was a first. He said: “Thomas told me he was trying to replicate the behaviour of a goat as far as he could and as part of the project he asked me to try to make him walk in as much of a goat-like way as possible, so we looked at making prosthetic additions to his limbs. “I actually told him that if he wanted to move like any animal, I would recommend he tried to mimic a bear, because they are much closer to humans and put their entire feet on the ground – but unfortunately his grant specified that it had to be a goat. 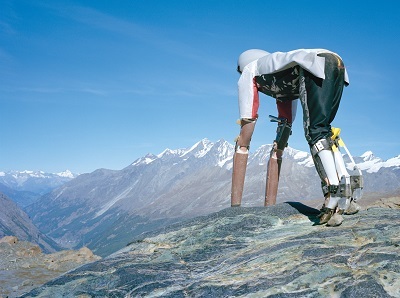 The limbs were specially designed so Thomas was able to walk putting his entire weight on artificial ‘hooves’, while they also had to be extra tough to withstand the harsh mountainous terrain. The academic even says he has spotted a potential practical application from the research. Thomas has now written a book about his experiences becoming a goat, including how the prosthetic limbs were designed, entitled Goatman: How I Took A Holiday From Being Human (Princeton Architectural Press), which is published on May 17.